Nick Cartell in Les Misérables. Since the touring production of Les Misérables currently at the Kravis Center’s Dreyfoos Hall was created to celebrate the musical’s 25th anniversary, that means it has been on the road for eight years by now. But you would never know it from the razor-sharp, tight and extremely well-sung performance that opened the weeklog run Tuesday evening. True, the physical production is simplified from the original epic show, and the brilliant, cinematic, turntable staging of Trevor Nunn and John Caird is sorely missed. 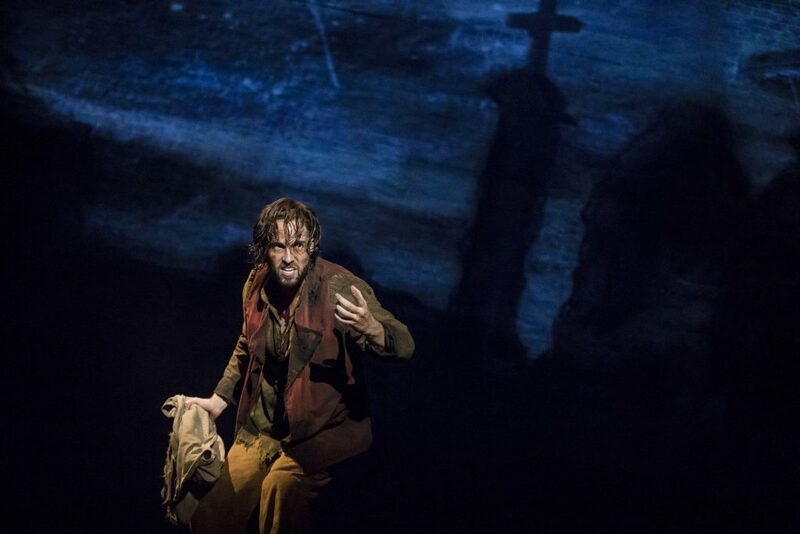 But it is still Les Miz, the best of the British mega-musicals of the 1980s, a textbook example of how to adapt a sprawling classic novel, and it is welcome in almost any form. Among this version’s selling points are sets and images inspired by the paintings by Victor Hugo who, of course, wrote the source material in 1862. While he probably should not quit his day job, as most of the backdrops are murky and muddy, a scene of animated projections moving through the sewers of Paris works superbly. More of that visual technique would have helped the show’s flow. The new co-directors Laurence Connor and James Powell have several other inspired ideas that keep the production of interest to longtime fans of Les Miz, but its primary appeal is probably to those who have never seen the show previously. For their sake, at least those who were never assigned to read it in literature class, it is the story of Jean Valjean, a petty-thief-turned-prosperous-mayor, and the romance of his adopted daughter Cosette to reluctant revolutionary Marius, set against the bloody student rebellions of 1832. And against this historical backdrop, Valjean is doggedly pursued by police inspector Javert. Hey, it’s social struggle, the quest for redemption and a lot of power ballads. What more could you want? 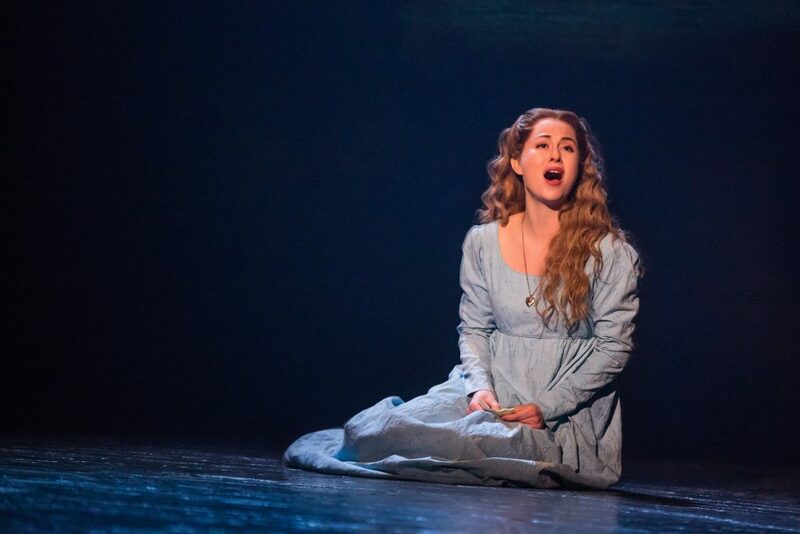 Mary Kate Moore in Les Misérables. Other standouts in the cast include Mary Kate Moore as Cosette’s mother Fantine, who sings her killer gymnastic aria, “I Dreamed a Dream,” then promptly dies, only to return for an encore two hours later. Paige Smallwood has a nice stage presence as Cosette’s sidekick Eponine, who pines for Marius as we hear in the pop solo, “On My Own.” I’ve never cared for the comic relief of the sleazy Thernardiers, but J. Anthony Crane and Allison Guinn manage to curtail some of the characters’ usual excesses. The symphonic score by Claude-Michel Schönberg remains stirring, leading to the thought that one day Les Misérables may be performed by opera companies. Until then, if the show at the Kravis is a reliable indicator, it is in the capable hands of its original producer, Cameron Mackintosh. LES MISÉRABLES, Kravis Center Dreyfoos Hall, 701 Okeechobee Blvd., West Palm Beach. Through Sunday. $41-$109. Call 561-832-7469 or visit www.kravis.org.